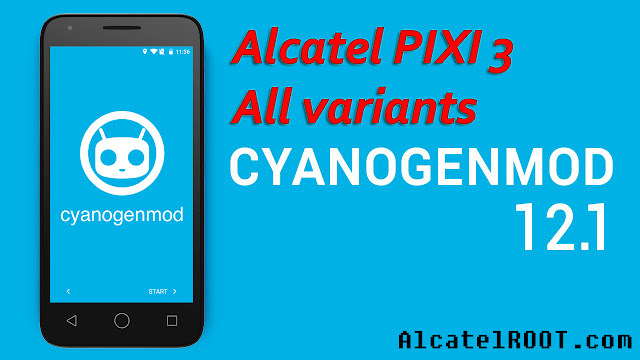 That's amazing surprise to has CyanogenMod on MTK based device Alcatel PIXI3. As you know CyanogenMod is the best custom ROM developed ever on the market. 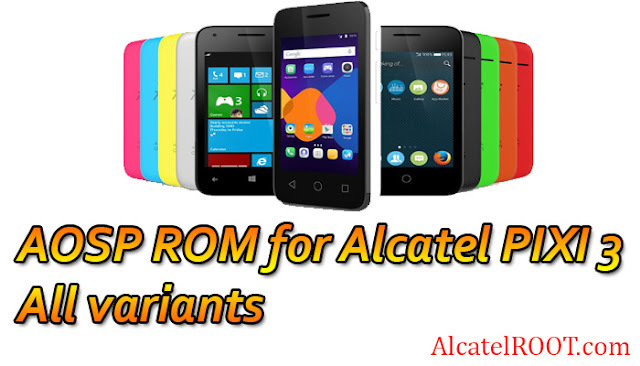 It's a hardly optimized for fastest & smoothest working on all kind of devices in this situation of low-end devices as Alcatel PIXI 3 models it can work awesome than any custom ROM yet. No lag, no slow-down it's a CyanogenMod ROM give a try. Sound, GPU, CPU, Camera, GPS, Wifi, Bluetooth, 3G, Screen and more. 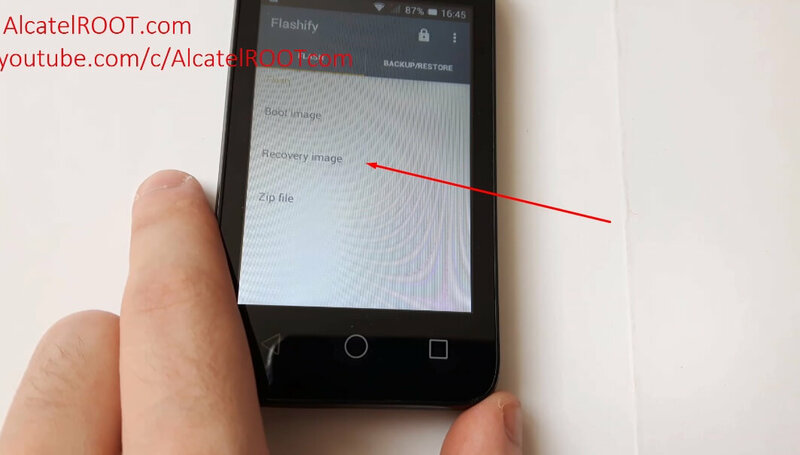 You need to have custom recovery to flash this ROM check out installation TWRP custom recovery . It's recommended to backup your current ROM before anything move on to backup button then backup!Once backup completed you can proceed of installation of CyanogenMod 12.1. 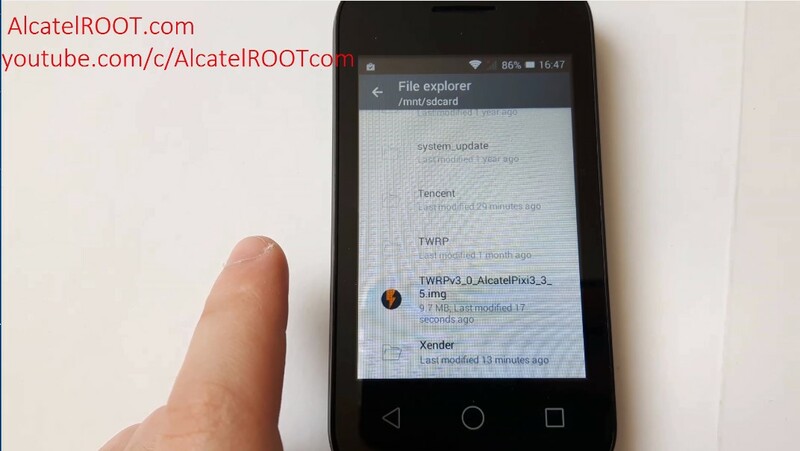 So, after you have TWRP on Alcatel PIXI 3. Boot into TWRP recovery by pressing first Vol UP + Power button by holding for 5seconds until you see TWRP recovery. Go to WIPE -> Advanced -> Wipe data,cache,system,dalvik. Then go back to Install and choose ROM which you downloaded before. 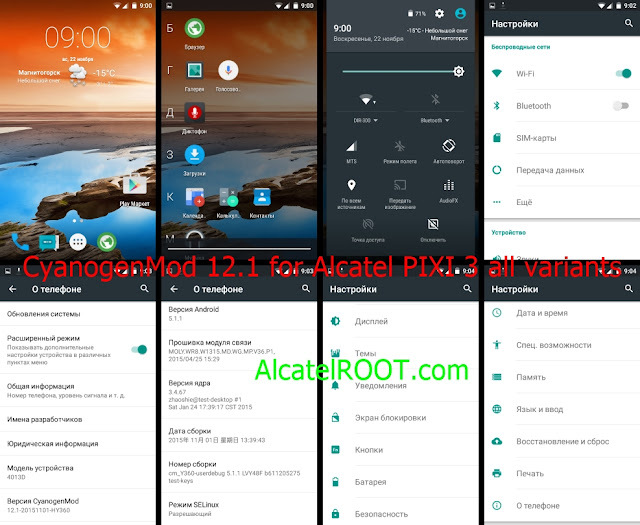 Once CyanogenMod 12.1 will completed installation! Go to install Gapps zip package. And after all you can reboot system! That's it, Enjoy of amazing CyanogenMod 12.1 on Alcatel PIXI 3. It is fast, clean from bloatwares faster than stock ROM of Alcatel One Touch PIXI 3. Provides battery saving with improvements with kernel and from OS. Unique features like Wireless FM radio, AOSP settings menu and many more inside. Optimized Wifi, Gps, Camera, RAM for better user experience. Graphics enhancements for no lag in Games. No need from root, already rooted. Always make backup before doing anyting on device, also I'm not responsible for any damage on your device.DO IT AT YOUR OWN RISK! 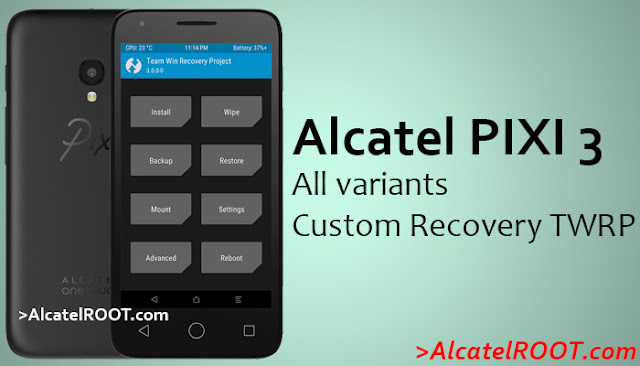 Needed custom recovery to be installed if you don't have install from POST "Custom recovery for Alcatel PIXI 3 all variants". Copy ROM zip to SD card or Internal memory for your model from below. Go to Wipe -> Advanced -> do wipe data,cache,system,dalvik. Back to install and locate ROM zip file depends where you copied before. When you find ROM press and confirm installation! Wait some time to complete! 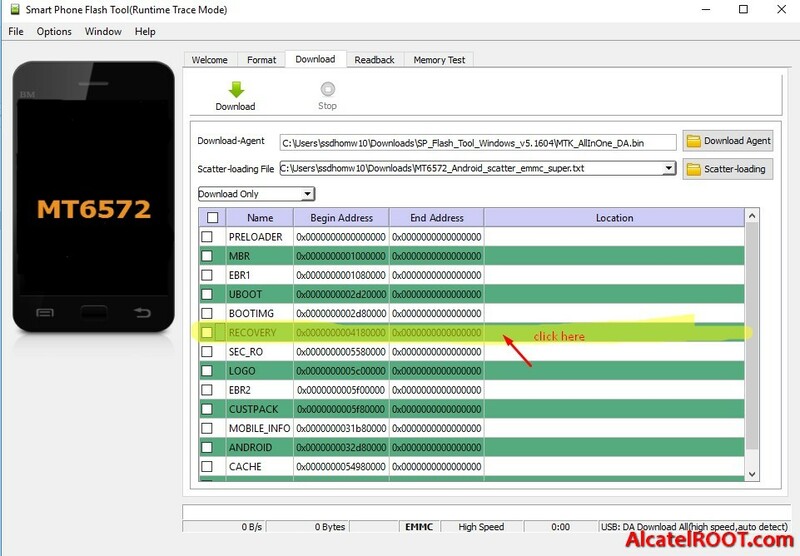 That's it, Enjoy of AOSP ROM on Alcatel PIXI 3.
note: in video there's 3 flashing zips but I've combined into one and there's no need to flashing anything than ROM. 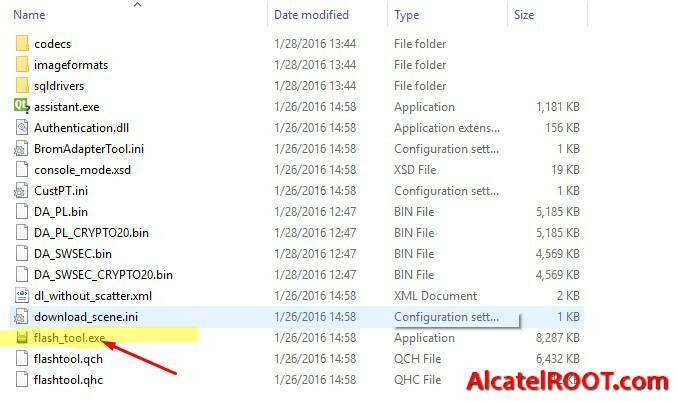 Alcatel PIXI 3 above variants are powered by MTK6572M dual-core CPU but there's some other variants with qualcomm CPU, also this TWRP not applicable for them. For what is needed this one: With custom recovery You can install custom ROMs, Tweaks, mods, etc. 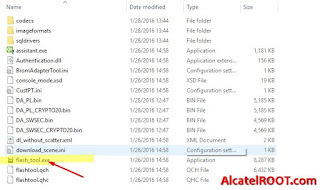 - You need to have root access on your Alcatel PIXI 3 to install directly on the device, check out this post tutorial How to Root Alcatel PIXI 3 oneclick Root or here's the video of rooting Alcatel PIXI 3. - So let's suppose you have now Rooted Alcatel PIXI 3. Download TWRP img for your model below and copy to Internal memory or SD Card. Download from Play Store Flashify app. - Open the Flashify app. - Go to recovery flash like on picture. - Choose file explorer from right appearing menu. - Navigate to /mnt/sdcard (internal memory) or /mnt/sdcard2 (external card) depends on where you transfered twrp img file. - When you find img file press it and confirm flashing! 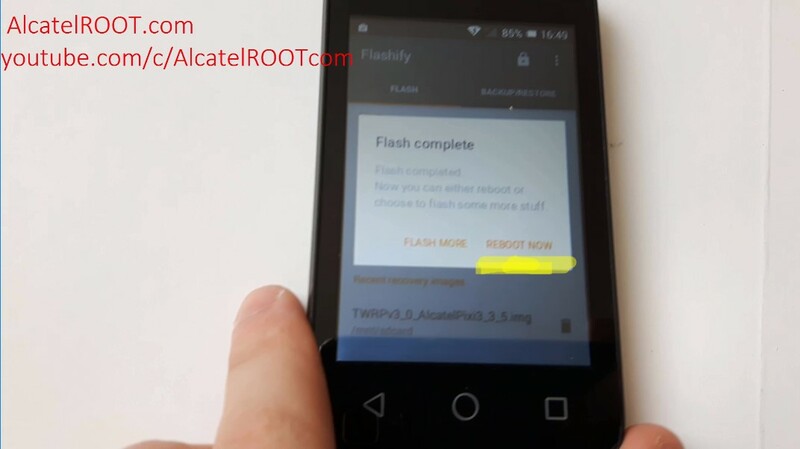 - Once TWRP recovery flashed successfully it will ask you for rebooting into recovery! - That's it for this method of flashing custom recovery on Alcatel PIXI 3. Forget all grudges, accept every mistake, forget all sorrows and spread love for god’s sake. 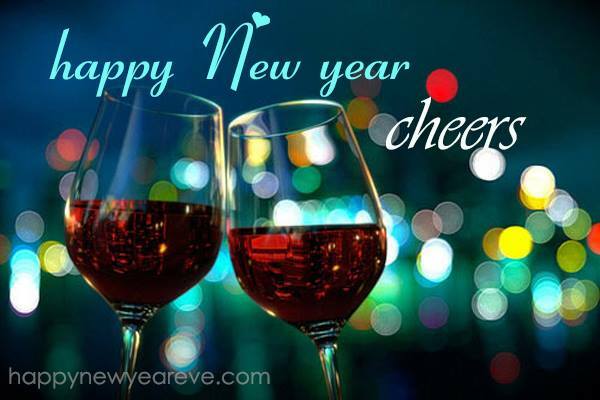 Wish you a really really fulfilling and joyous 2016. Happy New Year. Here we go a Android Lollipop Looks ROM - LOLLIFOX.A Lollifox ROM is the fastest and smoothest ROM developed ever for Alcatel Idol mini 6012 - MTK6572, also it available for other chipsets like MTK6589, MTK6582 etc.ROM developed by fmddev team which provides best user experience with Android Lollipop looks it has themed to provide amazing looks, fast & smooth running on MTK6572 CPU which is in range of low-end chipsets. If we compare with stock ROM there's no two opinions 'cause ROM running really fast with trully improvements and enhancements. - Some improvements for graphics, sound, sensors, calls, 3g, wifi, camera etc. - 100% I missed some things! - first make sure you've Root. (if you don't have check out this post). - Boot into Recovery by holding together Vol up + Power button for 5seconds. Go to WIPE and choose factory reset then confirm. Go back to main then INSTALL and choose zip archive which previously put into your SDcard. You can reboot your device. Enjoy of this great ROM. Go to wipe data/factory reset and confirm. Go to install and choose zip archive which previously put into your SDcard. 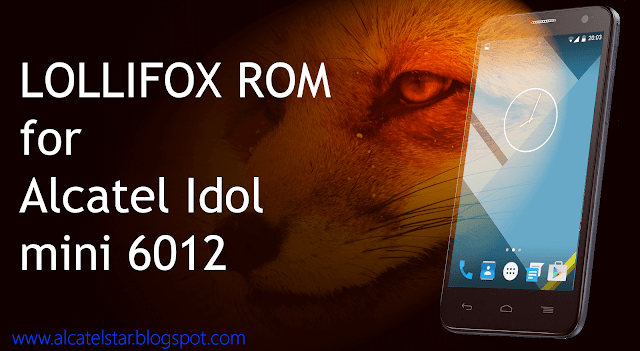 Reboot & Enjoy of Lollifox ROM. In this tutorial I'll describe How to Root Alcatel Pixi 3 4009d Alcatel Pixi 3 4013d Alcatel Pixi 3 4027d Alcatel Pixi 3 5017d.No PC required you just need from internet connection for downloading Kingroot.Kingroot is app which will root your Alcatel Pixi 3 with just One Click Root for about 1min it's pretty amazing.You can root your Alcatel Pixi 3 which comes with Android Kitkat 4.4.2 at 100% guarantee of root success. First download app from this - LINK. Put into sdcard or internal card. Make sure you're checked unknown sources for installing non-market app.Options is located in SETTINGS then SECURITY scroll down to locate Unknown sources. Then open it and press try to root! Process takes up to 1min. Finally you'll see Root is succesfully!!! 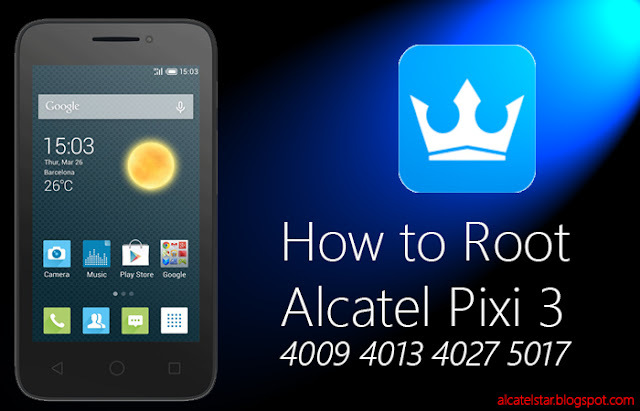 As you can read it's super simple just one click to root your Alcatel Pixi3. In this Tutorial you'll learn How to Unroot your Alcatel device or any other Android device with SuperSU app without PC needed just with one click.SuperSU will fully Unroot your device and you don't worry about warranty if you're needed to return to service for repair just like factory state. SuperSU is root management tool which is most popular app around Android users. 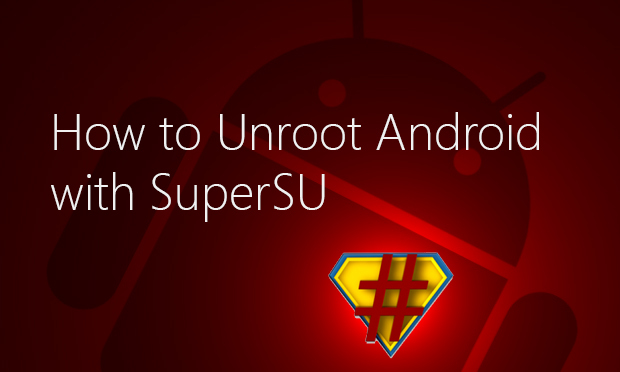 First if you're Rooted your device with Framaroot One Click Root App you need from SuperSU app download from market - here or if you're already using SuperSU. Open SuperSU and go to setting. Scroll down to option Full Unroot - cleanup for permanent unroot. Press this and confirm unrooting! Wait some time untill app says you're device is unrooted succesfully and reboot device. Finally you can check with Root checker or other app for sure if you're unrooted. note: this method doesn't work if you're rooted with Kingroot app. Here's the Video tutorial How to Unroot your Android Alcatel device or other Android! 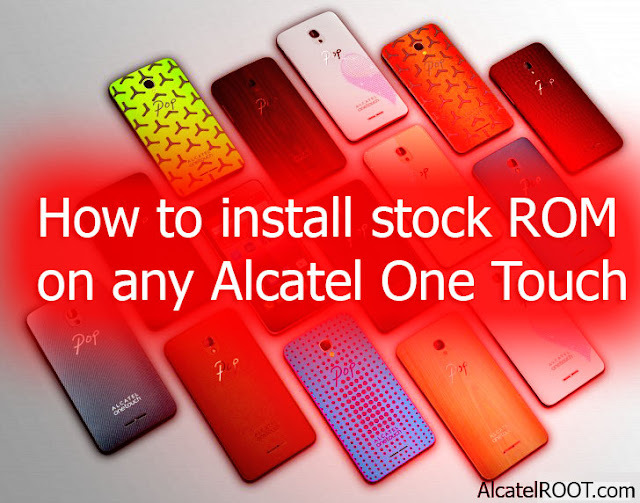 In this tutorial you'will learn How to Root your Alcatel Idol mini or any other Alcatel One Touch Android device even too most Android devices with another processor Mediatek, Qualcomm, Exynos etc. 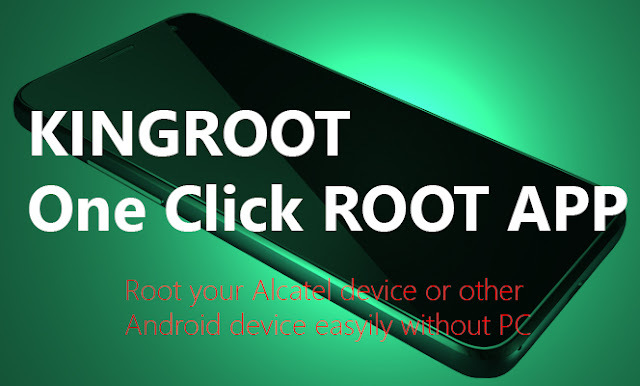 It is almost a 100% guarantee One Click Root App which will root your device without PC, USB or another device needed it's Kingroot app One Click Root. 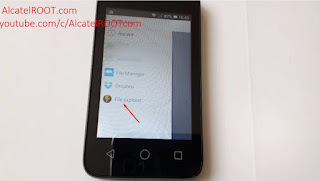 Kingroot has ability to root your device with single click root app. Disclaimer:We or no one can responsible for any damange on your device.It's your risk! First download Kingroot apk from - here. Then transfer to your device with USB or Wifi app or directly download into your device with Android browser. Make sure your're checked unknown sources option in settings->security. Then install Kingroot into your device. 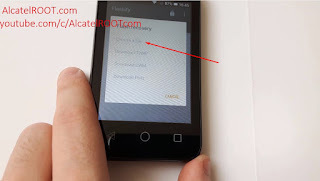 Here's the Video tutorial How you can Root with Kingroot app!